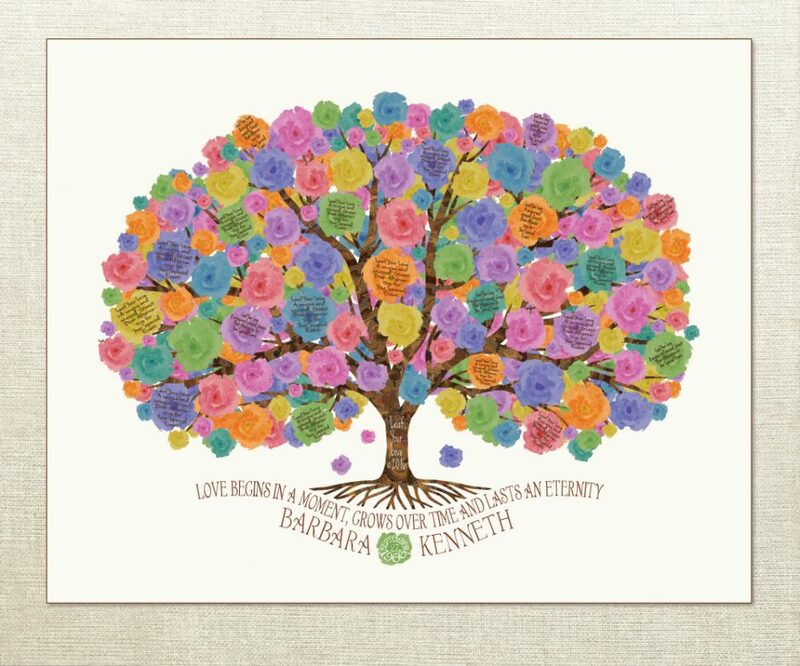 HOW IT WORKS: A Leaf Your Love guest tree is an artwork alternative to the traditional guest book that often ends up in a drawer after your wedding or event is over. You might create a tree for a wedding, an anniversary party, a bridal shower, an engagement party, a 50th, 60th, or 75th birthday, or any event where you want to remember all the people that surrounded you on your special day. YOUR MESSAGE: You decide the message you want your tree to convey in the roots of the tree: Maybe the lyrics to a song that mean something to you and your special someone, or perhaps the word ‘love’ in seven different languages along with the date and place you will tie the knot. Or perhaps you’ll be giving this as a gift to the guest of honor and you’ll find a quote that is perfect for the event. The message can be the color of the tree’s roots or you can select any color you’d like, and select from 10 different fonts. LEAVES OR BLOSSOMS: You select the leaves or blossoms of your tree – a fresh green palette, or perhaps vibrant autumn colors, or maybe festive colorful blossoms perfectly placed on your tree and ready for guests to leave a message for the guest of honor. There are 6 leaf and 2 blossom mixes to choose from. ADD CREATURES: You may prefer the tree with its intricate bark design to stand alone as the sole design element. Or you may want to add some birds, butterflies, dragonflies or squirrels to your tree. You could have five birds to represent a 50th birthday celebration (one for every decade) or seven different butterflies for a Golden Anniversary celebration – representing the couples’ seven grand children. Or a pair of squirrels sharing an acorn to represent the bride and groom. There are unlimited ways in which you can use Eco elements on your tree. SELECT A BACKGROUND: You may want the tree to “pop” on a natural white background, or you may prefer to see your tree against a sunrise or a midnight sky to add more color to your design. PROOFING: After you’ve selected all your design elements, in about a week, I will email you a jpg draft of your tree. You can email any changes back to me and I will send you another draft. If you need more changes, that’s fine! Usually it takes one or two revisions, but, as many as you need to get it looking just right. Then, once you love it, I will print and ship the package to you. LEAF YOUR LOVE: Guests at the wedding or event are the final step to creating your tree, by forming the veins of the leaves – with their written message to the guest(s) of honor in a leaf. It is definitely a unique, one of a kind thing – a change from the usual guest book – for someone that likes to do things … just a little bit differently. And your guests will think it’s pretty fun too.